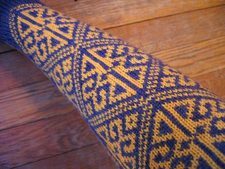 Pattern: Blue and Cream Stocking from Meg Swansen’s Knitting . As I described earlier, this isn’t so much a pattern as basic guidelines – something I personally welcome wholeheartedly, but not something I would recommend to just anyone. Needles: size US 1 Susan Bates, two circulars and 5 dpns (yay!). Yarn: Sundara Yarn sock yarn, in 006 and 024. I used a good portion of 1 orange skein, and just a bit more than 1 skein of the blue. Gauge and size: gauge in stranded section: 8.5 spi, 9.5 rpi (more for my own personal records than anything). The stocking is 12.25″ in circumference at the calf, 6.25″ in circumference at the ankle, and 18″ long from cuff to bottom of heel. Yeah, this thing is huge!!! Let’s cut to the chase – I love it! I LOVE it! I. LOVE. IT! I put some more pictures, the modifications and my thoughts about this project in the extended entry, so click on the link below if you want to read more! Modifications: many ;). I adjusted the guidelines to accommodate the shape of my leg – I started with 106 stitches, and decreased them to a measly 54 by the time the ankle was reached. That’s right, shapely ;). In order to have 106 stitches at the top, I swapped in a different side motif, which I found in the Ram’s Horn Cardigan pattern in the same book. I took many liberties with the decreases (I had to! That’s a lot of decreases!) – I write some thoughts below. Along the lines of calling this pattern “guidelines,” I’d like to point out that the Heel saddle instructions in the book are wrong, and I had to turn the heel the best way I know how – the Nancy Bush way ;). I am not as confident in saying this, but I also believe the Loving swath/arch shaping instructions have a mistake, and I knit the arch to be symmetric rather than follow the words, which would lead to an asymmetric one. We do what we have to do ;). 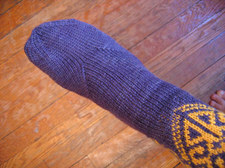 I chose the French Toe from Nancy Bush’s Knitting Vintage Socks (p. 21) because it looks exactly like the arch shaping, creating a wonderful symmetry and flow – do you see what I mean? Knitting with two hands: Although it takes practice, this is an awesome technique that is intuitive and elegant in its simplicity. I just wish it was more portable, because, damn, I could impress so many people if I could knit this way in public ;). Just imagine me at the Post Office standing in line, knitting with two colors! Knitting by throwing the yarn with my right hand (English-style) and knitting on two circular needles: only when I have to ;). Calf shaping: Let me boast for a second – the sock fits absolutely phenomenally. There is definite benefit at noting the actual shape of the leg, and placing the bulk of the decreases right where the calf tapers into the ankle. However, I don’t think it mattered that I made the back decreases at a different rate than the front ones. On the other hand, I can see the benefit of having only back decreases for a very shapely leg such as mine. They would still have to be placed at the narrowing of the calf. Arch shaping: Easily the cleverest thing I’ve encountered this year! The reason it works is because it places the stitches at the bottom of the foot on a bias, which snugs up the fabric nice and tight right into the arch. And we all know about the snugness of stitches placed on a bias, right? 😉 The only downside is that the arch shaping is limited by whatever pattern happens to be on the instep, and one may not be able to easily incorporate it into a sock that already has a lot happening at the top of the foot. However, it’s not impossible ;). Why? Why would I knit socks that I wouldn’t ever wear? That I couldn’t ever wear? That I won’t even use as a Christmas stocking, being not Christian? First, it’s singular – just a sock. No sense to knit two of the same exact thing if there’s no function for even one. Second, I enjoyed every single little bit of this project – selecting the pattern, choosing the yarn colors, learning to knit right-handed, learning to knit two-handed, figuring out the calf shaping, being captivated by the arch shaping – and that’s more than enough reason to knit, don’t you think? Your sock is amazing. I love the pattern and the colors. You are triumphant!! Wow!!! I am truly amazed! Wonderful work! Very, very cool. 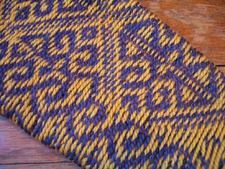 The pattern looks…Valkyric…like you should be holding a battle-axe and shield, and have long yellow braids. (On your head, not the sock.) LOVE the arch. That sock is so awesome. If it were my sock I would go out and buy a skirt just so that I could wear my socks. I hope you plan to show it off! The arch shaping is extremely impressive. Truely deserving of the 360. They are awesome!! Great work. Oh Kathy, it is beautiful. I love it! That single sock! Come on, knit the other and wear them under jeans…you will only sport the blue perfectly shaped foot…and only you would know of the fabulously knit leg. I love this sock, especially the foot shaping. I went in search of the vintage sock book last weekend with no luck. I guess I will have to buy online. Wow!! I am so impressed, the sock is astounding. Great job!! Wow, those are amazing. Wonderful job! That’s a great sock! Do you have plans to incorporate your newly learned sock arch technique into future sock pattnerns? You could use yellow yarn and call them “Golden Arches” 🙂 Sorry, I am a little punny today. Fantastic job. Really. IT’s amazing. Amazing. Almost make me want to make a pair of socks. Almost. Great job, they are a testament to your artistry. Please, please knit the other! 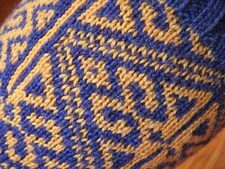 You could even knit it different but related; different pattern on top, or the blue foot but the leg a new color. Then you can wear them in the house, or when you visit a no shoes house or under clothes where only you will know they are there! That looks awesome! You’re such a pro, and I also love how the arch shaping looks as well! A-maz-ing! You did a fantastic job. And I’m so impressed that you did it just for the sake of doing it. It is beautiful Kathy! What a gorgeous sock, and while I understand your resoning behind only knitting one, I have to say you MUST knit another – come on! You can gift them to someone who would wear them – its just too stunning to not have a mate. Beautiful sock! Was the pattern (er… guidelines?) for the arch shaping in Meg Swansen’s book? I really like how the arch & toe complement each other. I love that you knitted just one for the experience. I forget–is it because you’re allergic to the wool that you won’t wear this? Isn’t there some other fibre you could make them out of, that you could wear? It’s so lovely. What a great sock. It is such a shame you can’t enjoy wearing it. I love how the pattern extends down a little over the ankle bone. Oh man, that’s a fabulous sock. I absolutely love it. And yes ma’m, that definitely is enough reason to knit a sock. How liberating – only knitting one sock. Wow! I cannot believe that sock is finished so quickly! The sock is simply amazing. Beautiful! Phenomenal ! I’ve always liked the look of that arch shaping. Very clever. Knitting one spectacular sock just for the thrill of it sounds good to me. Most most most BEAUTIFUL sock I ever seen!!!! Amazing job!!! Knit the other one!!! I LOVE it. I want to make one!!! I think you should find some way of displaying it, since you can’t wear it. Or find someone who *can* wear it, and let her knit the other one. Wow! Those are incredible! Really love them! That is seriously amazing! Kudos! That one sock is very beautiful! 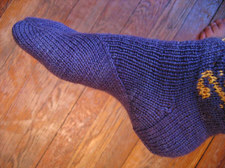 And I think you would incorporate the arch shaping into your future sock knitting projects … right? At least those you knit for yourself, I think. Besides, I am intrigued by the one-leg photo shots … where did you put the other leg while waiting for the self-timer to go off? You must have an excellent balance! What an amazing sock. I love how the pattern flows. You did a great job and your attention to detail is wonderful to read. Absolutely gorgeous. Such a shame you won’t be knitting it’s twin. Are you sure it isn’t just second sock syndrom? The sock just begs to be shown off and you are going to throw it in a drawer somewhere. It needs to be oogled in person not just online. Holy cannoli, that is impressive. Here’s what I wonder about stranded-knit socks– don’t your toes catch in the little bits of carried yarn inside as you put them on? The construction looks really interesting! I love your choice for the toe. I vote for framing it. Wow! Beautiful and an amazing fit!! Congratulations on a wonderful job! Now I really can’t wait to see what you do with some fabric and a skirt pattern! Wonderful! I hope you will contact Meg Swanson at Schoolhouse Press and let her know of your success – if you haven’t already done so. Meg is one of our Wisconsin treasures. Also – thanks for an informative, truly entertaining blog. i can’t believe there is just one of these socks! it is exquisite. it is sock perfection. the arch shaping is the most extraodinary thing i have seen in years…i must give it a go sometime. surely this sock has magic powers, no? Perfection. That’s all I can say. I love the curlique along the side. It reminds me of quilt borders where the block breaks out of the frame. That is truly awe-inspiring. I think I need a cocktail now. Your insides are just as gorgeous as the outsides. Just _how_ did you manage to get those innards so even? That is one amazing sock! I love love love the arch shaping. I love the whole foot. I love the whole sock, but the way that foot is shaped, gorgeous! It’s so pretty! A shame not to be able to wear them (it, I mean, it) but I certainly understand that it has fulfilled its destiny in your life. Being a process knitter, I completely get why one would knit one sock for the sake of challenge and enjoyment — a sock which one cannot even wear. Those are amazing!! I don’t think I could ever take them off!! That sock is just absolutely, amazingly beautiful. Since you’re not going to be able to wear it, I hope you’re going to use it as a decorating item, so you can show it off…. i’m speechless! i would love to do the fitted footed part, color work is not my thing but you have left me speechless with the glory of your colorways. 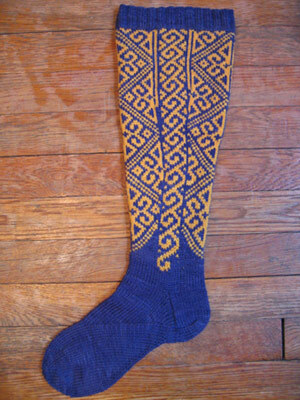 Those socks are gorgeous…makes me want to try colorwork! look at that shapely leg! grrrowl! that sock just accentuates all your lovely curves 🙂 you did a beautiful job! 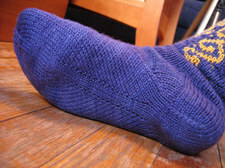 would you be interested in making more socks like this if you could find a fiber/yarn that suited you? This sock is MAGNIFIQUE!!! Outstanding work!!! Do you plan to make the other one? What a beautiful sock! Congrats! Absolutely gorgeous! I am stunned and take a deep bow. What a gorgeous sock. Beautiful work, Kathy! i’m with kris! what did you do with your other leg??? i’m incredibly taken with both the toe and arch shaping. they look great. I am amazed!!! This is beautiful!!! I can’t believe you’re going to leave him alone!! Won’t you knit a pair?? 😉 Just for practice??? beautiful work. so, you have to finish the pair. 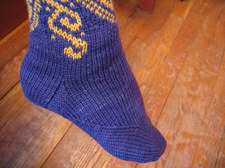 as beautiful as the colorwork is, i have to say ilove the foot shaping more. how cool is htat? No offense, but I can’t believe that you aren’t going to make the other sock. This one turned out phenomenally, why not make the other? If if they are just to wear around the house. Of course, I would wear them in public with a sign that says I made these. Wow . . . the arch shaping is really, really cool! That sock is amazing! The pattern is so striking, and the foot construction is beautiful. A work of art. wow. that foot shaping is beeeeeutiful! I actually took this book out of the library a week or so before you started your socks. I flipped through it and I give you so much credit as a knitter for interpreting the pattern, and changing up the charts! There are so many beautiful patterns in there. You have inspired me to do something similar on a (be it) smaller pair of socks! This is something else. I love it. Really love it.It is so beautiful. I am new with KBTH and still have so much to learn. Will you have the pattern ? The socks are beautiful!! The skill that it took to make them is leaves be breathless. This is GORGEOUS and so, so impressive. Never mind that it’s not functional for you. I think it’s meant to be a work of art that is proudly displayed. Perhaps you should try to get one of those mannequin legs they have in hosiery departments and put the sock on it to display it. dude. you’re not going to wear it/make another/wear them? i would sooooo be wearing those and i beg you to please please please put together a pattern. i want to knit at least three pairs in different color combos! most amazing knitting i’ve seen yet this year!!!!! Wow… just wow! I’m speechless. We should all have so many reasons to knit what we knit. good god girl. how do you do this? didn’t you just start this yesterday? i’m still struggling with my one single-stranded sock. it’s BEAUTIFUL! My heavens that is gorgeous. I just started looking around for my first project to try in two color stranded knitting, and it has been an inspiration to watch you tackle these — and the end product is, literally, awesome. I’m so glad you have a blog to share with us what goes on in your knitting! aces, kiddo! those are incredible – love the 360 pics, too! absolutely gorgeous. damn – i want a pair. i’m sure i could figure out SOME way to wear them! I am breathless! I cannot BELIEVE you’re not going to make the other sock! I would wear those EVERY DAY! Lord, it’s stunning. If you’re really not going to make a second sock, I also vote for framing it. It would look fantastic on the wall! I feel dizzy just imagining trying to knit those puppies. You are one damn talented knitter. The sock is fantastic. Personally, I think you should frame it and hang it on your wall. It would be a fitting testament to your knitting prowess. You continue to amaze me. Incredible socks! I am sooo impressed its unbelievable. Well done, get that frame out and hang it somewhere with pride! Why, indeed! A) I agree with the commenter who says you could get one of those half legs for display they used to have in hosiery departments. B) I bet you’re going to turn this one-legged knitting experiment into something cool in future. 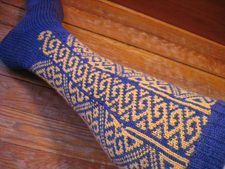 Hint – I could use a good pattern for a snug sock instep…. Wow! I’m #93, but just had to tell you your socks are really beautiful! You did a great job. Stranded/color work is my next project, when I can find one for someone that hasn’t done it in several years. Okay, that is great. I LOVE it. Where is the other one??? *grin* Please don’t fall prey to SSS. I really really really like how the foot looks. Well, I really really really like how it ALL looks. Those are really beautiful. I bow down at the majesty of your knitting talents (and Sundara’s dying skills!). Okay, definitely a shadowbox, but some kind of open one so you can still fondle it. And I think you might need to take a plaster cast of your lovely shapely leg to display it on. A mannequin wouldn’t show how beautifully it’s custom-fitted. And you’d definitely need the cast to be in a position that would show off the instep/toe transition. Gorgeous. The sole of that sock is the coolest thing I have ever seen in my entire life. that is awe inspiring! wow! *GASPS* YOUR NOT MAKING TWO??? YOUR NOT GOING TO WEAR THEM??? nooooooooooooooooooo say it isn’t so! Gorgeous. I especially love the shaping in the foot. I’m sorry you can’t wear it, though. You are the ultimate process knitter! And here I thought I was one, you put me to shame. The sock is beautiful and the arch shaping is pure genius. Maybe if you knit socks for me I would understand why people love handknit socks so much. I appreciate it in the same way as I’d like a neat-o sculpture in a gallery. OO, dear grump, the foot is TOO COOL FOR WORDS! The shaping is soooo completely fabulous! Wow!!! And glad you had fun with the stranding, it is a good thing which one must do more of. The view of the back is especially marvelous, and you’ve managed the decreases neatly indeed. omg!!! that is too gorgeous!! the color, the pattern, the shaping!!! you rock. What a spectacular sock! You must go to Meg Swansen’s knitting camp–you would love it and she would love you! Couldn’t you wear silk knee stockings underneath and be able to wear the wool sock on a cold day? It’s so beautiful and such a great fit. It’s nice to learn something from your knitting, but it’s nice to wear it too. I hope you can someday. Can I jump into the bandwagon and say “lovely” as well? Another vote here for “lovely!” And your photos are superb! Excellent and I love the arch shaping! All of the great adjectives are taken, but I had to comment to say how totally in awe I am of your knitting & designing skills. You are remarkable Kathy!! Incredibly beautiful, especially with the curve of your calf. Lovely. I love that foot! There’s another book you’ve added to my list. I love the unique shaping on the foot. That sock is huge!! Reminds me of the clock socks that I see patterns for!! So, tell me how long did it take you? It turned out very well. Pat yourself on the back. Wow Wow Wow! That’s amazing! Talk about cutting your teeth! You can rub your knuckles, too! Very, very beautiful. I am quite impressed! The sock is FREAKING AWESOME! I’m breathless. I am not worthy. I’m going to go rip everything I ever knit into little tiny pieces now. 100% lovely … Its a shame you can’t wear it but it would fantastic framed! ~ She definately deserves a place of honor. Great work! TOTALLY in awe! Just AMAZING! Ah, they are not huge. I would say you have perfectly lovely legs and the sock is beatifull. I need to get that book. knit another one and wear with a skirt! Just to tell you my calfs are 19″ and the ankles are 9.5″ so show them skinny little legs of yours 😉 . I’m utterly and completely awestruck. PERFECTION.